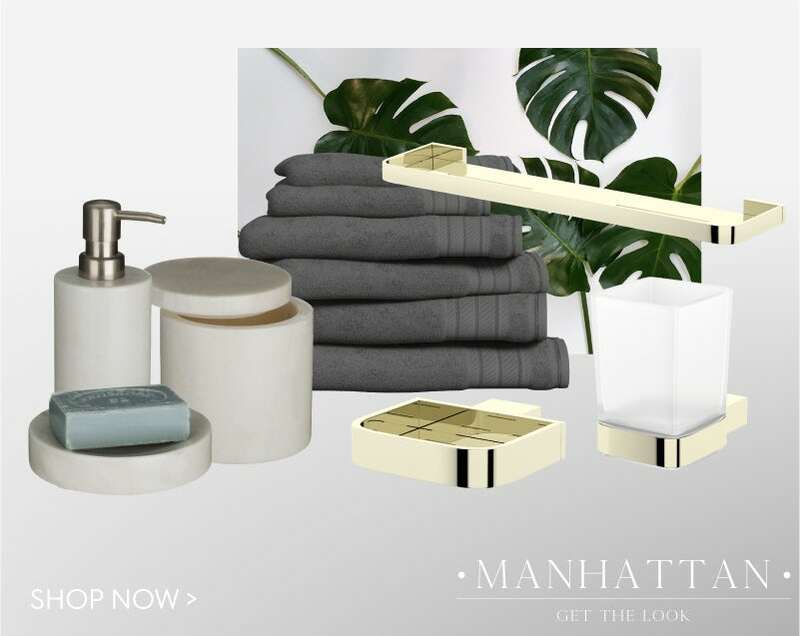 In the fourth and final part of this style guide, I’ll be cutting to the core of our Big Apple style bathroom, showing you exactly which VictoriaPlum.com products we used. 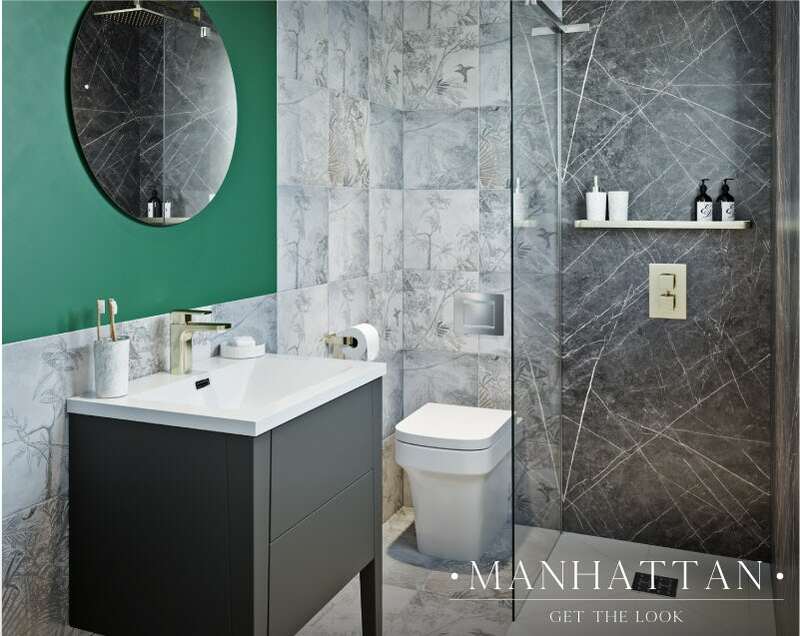 Our concept of a downtown New York apartment bathroom certainly isn’t a huge step away from some of the typical American bathrooms you may have seen in your favourite TV shows. Whilst it’s not quirky or eclectic like Monica’s apartment from Friends, you could imagine the likes of Don Draper from Madmen enjoying this more refined look, with its mid-century furniture and sophisticated styling. 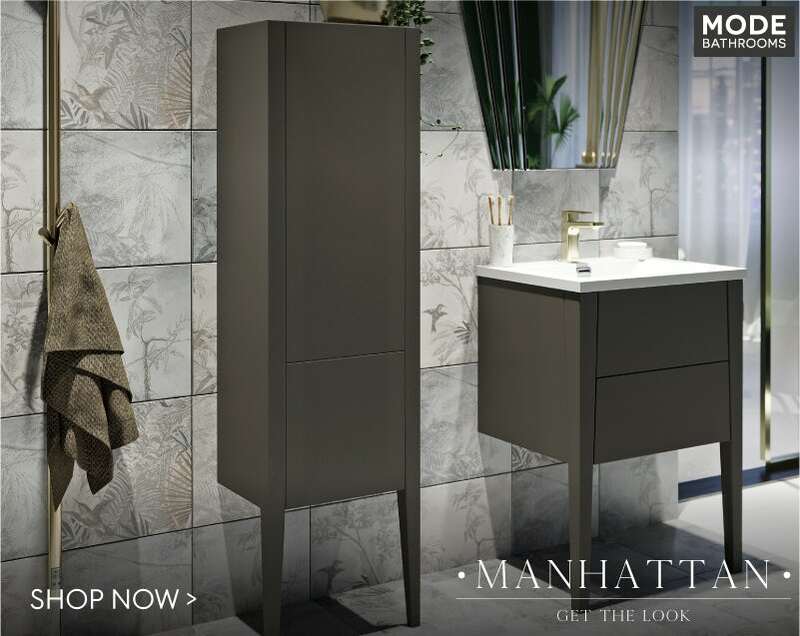 Whilst TV shows can influence the world of interior design, our Manhattan bathroom also draws on more contemporary trends, like the darker colours, coloured metallic finishes and artisan style tiles. 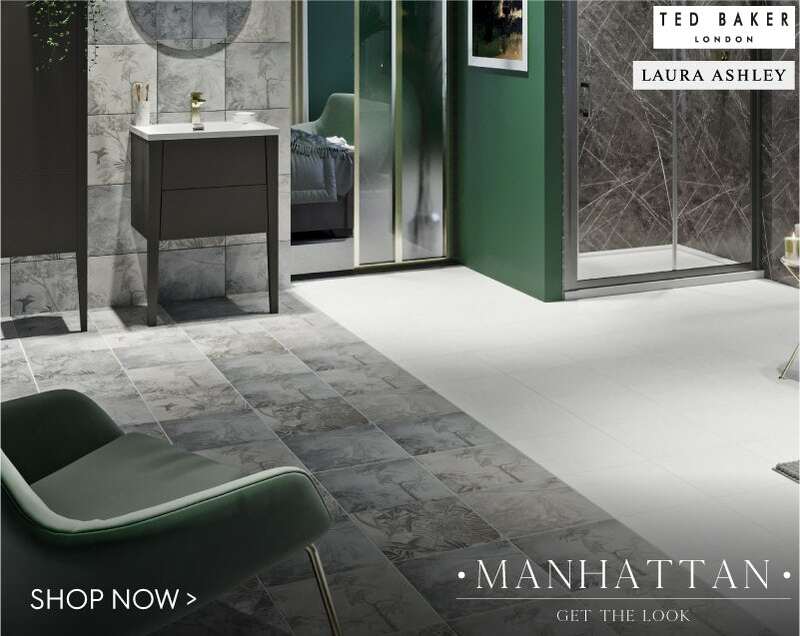 That’s why we mainly chose products from brands such as Mode Bathrooms, [Ted Baker] and Multipanel, as they feature unique, on-trend designs, made to the highest of standards. All across the globe, people are going crazy for mid-century style furniture, so what better place to start than with these fabulous storage units from the Hale bathroom furniture range? The semi wall hung design features slender, solid wood legs, exquisite line cut detail and handle-less, push-to-open, soft close drawers and doors. The added storage will help you keep your Manhattan bathroom clutter-free. The vanity unit comes complete with a countertop made from phoenix stone; a combination of glass and resin which produces a bright white polished finish. Meanwhile, for added detail, the storage cabinet comes with a fully painted interior. The mid-century look, which is a modern design style, is refined and sophisticated but not too ornate. The Greystone matt finish is the ideal accompaniment to our darker interior. 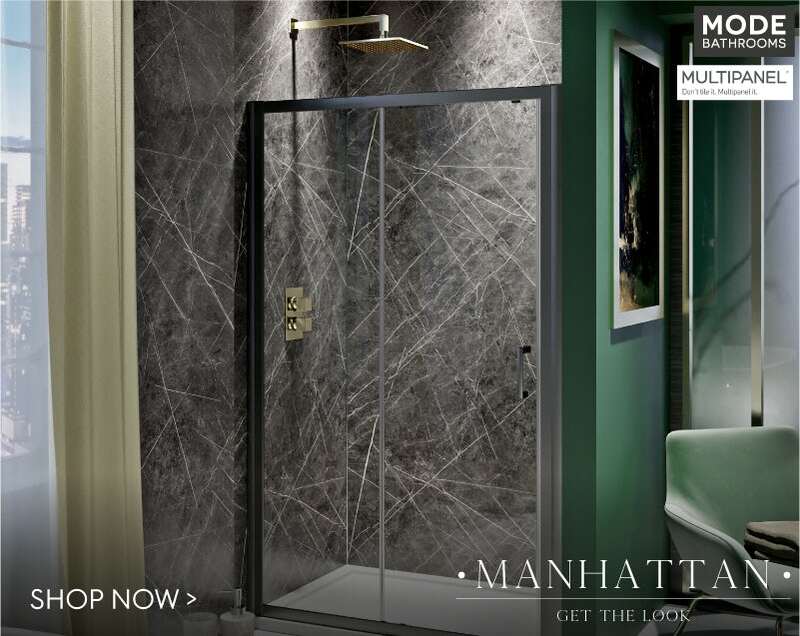 Another top trend which has influenced our Manhattan bathroom is the industrial theme. One of the most popular bathrooms at the Ideal Home Show, our Soft Industrial look has been worked into this design through the use of this black framed shower door. Black-framed grid windows and coloured metallic finishes (more of which, we’ll touch upon later) also go some way to subtly introducing Soft Industrial style to your bathroom. It’s a look that works well with apartment living. What better way to wake yourself up for that morning commute or rinse off the grime and dirt from your day, than in a luxurious thermostatic shower? Featuring a truly spectacular gold coloured finish, the Spencer shower set gives you precise temperature and flow control, along with a stylish square shower head and wall arm. The concealed valve provides a sleek and unobtrusive appearance, perfect for this refined, contemporary style. To create a luxurious and refined look, we used these gorgeous shower wall panels from Multipanel. Part of a range, designed in partnership with interior designer Linda Barker (of Changing Rooms fame), these stunning panels come with a Ferro Grafite design that gives the appearance of black marble, in keeping with the darker interior theme. What’s more, wall panels are much easier to install than tiles, providing a seamless look. Plus, with no grout lines, it’s easy to keep clean, with nowhere for mould to develop. Of course, a luxurious freestanding bath is a must-have item in any luxury bathroom, and this particular bath lends itself particularly well to the overall look and style. The slim edges of the Tate freestanding bath complement the slender legs of the furniture, with a more rounded and sympathetic shape. The unfussy design is highly contemporary, creating a spa-like feel—the perfect antidote to busy, city living. 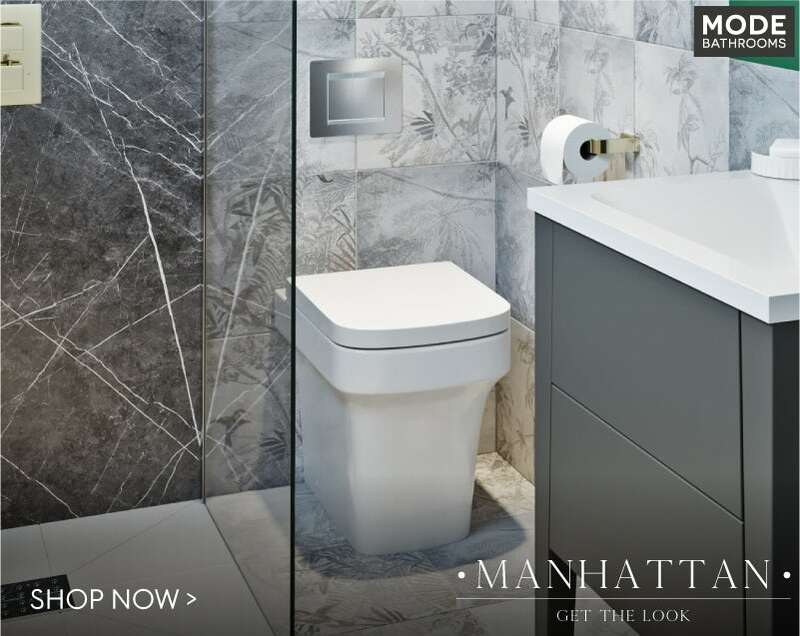 Featuring soft, rounded edges and a rectangular shape, the Carter back to wall toilet is a contemporary choice for our Manhattan bathroom. The back to wall design means the cistern is neatly concealed behind a false wall, leaving you with a clean, uncluttered space that’s free from awkward, hard-to-clean recesses and exposed pipework. The wall mounted chrome flush plate is neat and unobtrusive. To complement the rest of the gold-coloured metallic finishes in our Manhattan bathroom, we chose this unique heated towel pole, from our Foster collection. The stylish and alternative way to warm your towels, this gold coloured pole comes with 4 hooks, perfect for bath robes too. Unlike other radiators and heated towel rails, it doesn’t contain liquid, so there’s no maintenance required. The stainless steel construction makes for highly efficient heat output, plus, with a built-in timer, you can programme exactly when it switches on and off. The popular Paradise print from the Ted Baker really does have a story to tell! 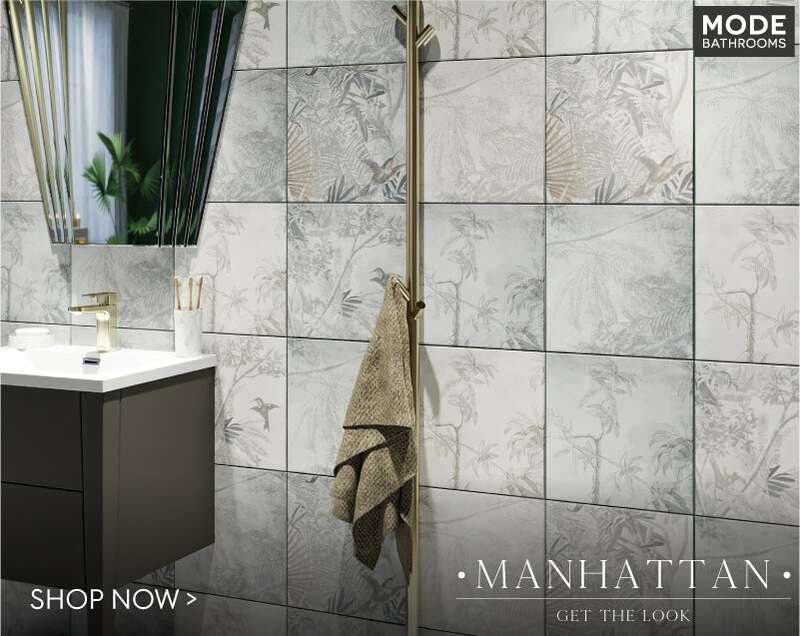 Originally, a clothing pattern, it has now found its way onto our Manhattan bathroom walls in the form of these gorgeous, designer tiles. Producing a real Artisan effect, these tiles will certainly prove a conversation starter when friends and family come to stay. Just like our Ted Baker tiles, our white satin floor tiles come from another name that is synonymous with fashion. The [Laura Ashley tiles] are simple yet stunning and add contrasting light to our darker walls. 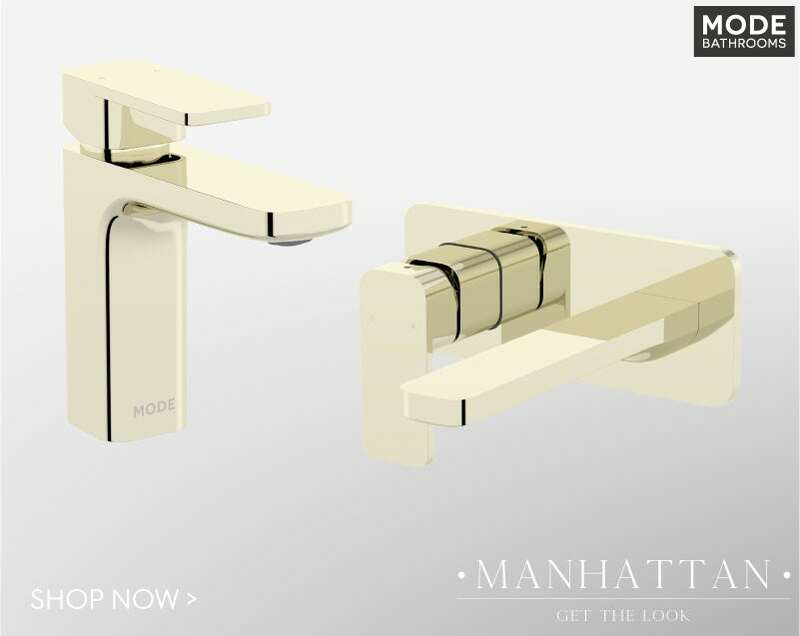 Away from the more common chrome, these matching gold-coloured bath and basin taps from our Spencer collection make a real splash in our Manhattan bathroom. Made from solid brass with a superior PVD plated finish, they give a nod to industrial style, whilst being very much on-trend. Keeping with the darker accent colours, this grey Croydex bath mat comes with a slip-resistant backing that is ideal for use on tiled floors. Darker colours are the order of the day in our Manhattan bathroom, which is why we’ve accessorised with these liquorice towels from the Christy Brixton range. A sweet choice for our suite! A refined room should have refined accessories, which is why we selected a soap dispenser and tumbler in white marble. If you like what you’ve seen, you can buy the complete small bathroom suite by clicking on the image below or simply browse Mode Bathrooms, which includes many of the products featured above. If the Manhattan look wasn’t quite your cup of tea (or should that be coffee? ), why not browse the rest of our style guides. You’ll discover a huge selection of on-trend styles for your bathroom and I’m confident you’ll find a look you like. 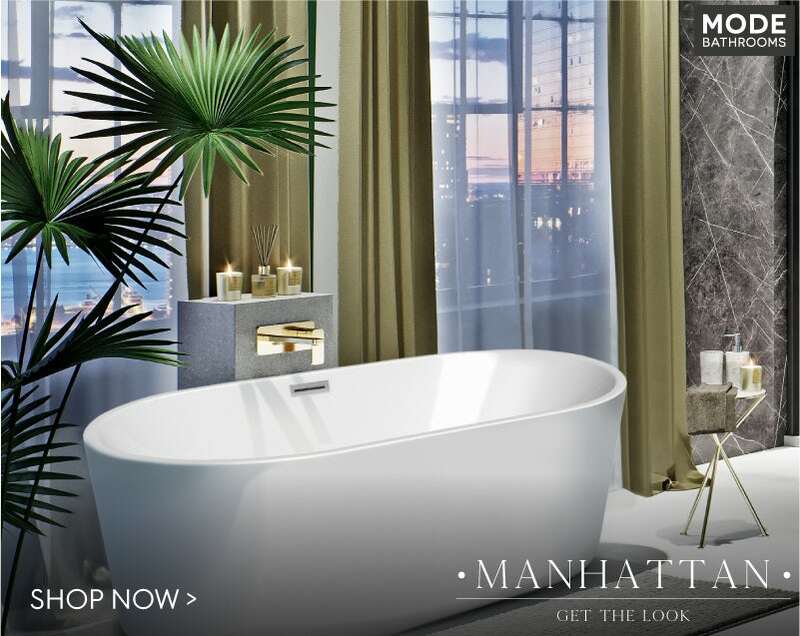 We’re venturing into the big city for our latest bathroom inspiration. In part 1 of this 4-part style guide, we’ll be taking a look at the very latest in bold, confident bathrooms that certainly wouldn’t feel out of place in a downtown Manhattan apartment. In part 3 of our 4-part style guide, I'll be serving you up a small slice of the Big Apple with a New York apartment style look in a small space. 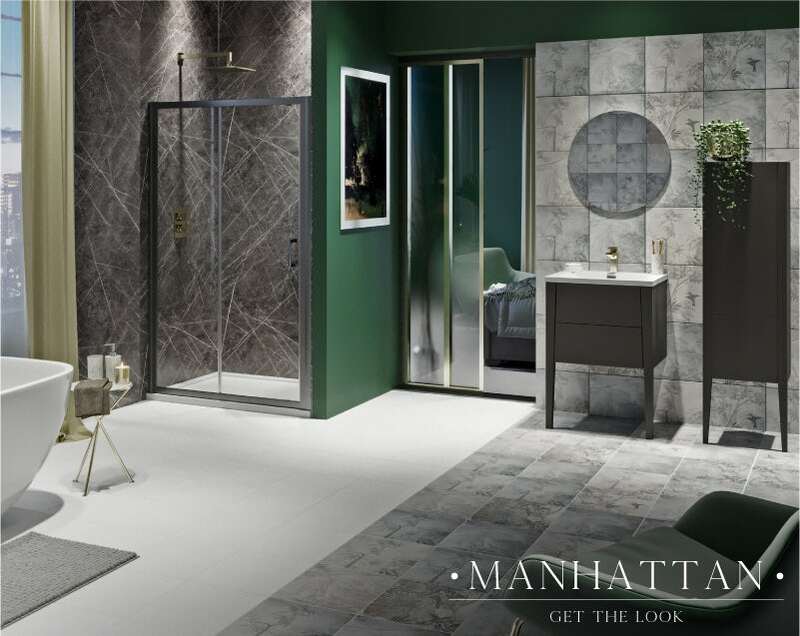 In part 2 of this 4-part style guide, I’ll be getting under the skin of the Manhattan look, showing you how to choose the right colours, walls, floors and accessories.